Brooks, rivers, ponds, and other bodies of water around Northeast Ohio all feed into Lake Erie, which in turn feeds into the St. Lawrence Seaway, which then feeds into the Atlantic Ocean. As storm water flows into Cleveland’s east side watersheds—an area of land that collects the water on its way to Lake Erie—it also collects anything thrown into storm drains. Translation: throwing anything down a sewer is the equivalent of throwing that item—be it dog waste, motor oil, lawn fertilizer, or other contaminants—into Lake Erie itself. Groups like the Doan Brook Watershed Partnership (DBWP) want residents to keep in mind that Lake Erie actually does begin on their streets, no matter how far from the shores they are. Cleveland Heights is a prime example of a city where stormwater does not go into a treatment plant, but rather flows directly into Lake Erie. Mills and other leaders at the DBWP hope to highlight this fact with its first Storm Drain Stenciling Saturday of 2018 on Saturday, June 16. Volunteers will gather at Cleveland Heights Community Center parking lot (1 Monticello Blvd.) 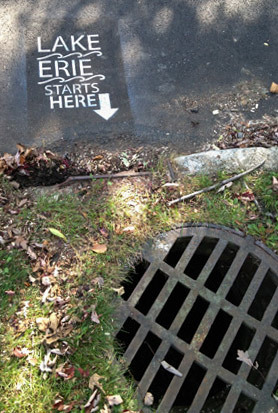 to stencil a two-foot wide message—“Lake Erie Starts Here”—in green and white paint on the pavement in front of storm drains in the Dugway Brook and Nine Mile Creek watersheds. The Doan Brook Watershed makes up 12 square miles that cover Shaker Heights, Cleveland Heights, and portions of University Circle, Shaker Square, Buckeye, St. Clair Superior, Hough, Glenville, and Fairfax neighborhoods. Doan Brook is one of five greater bluestone brooks (including Dugway Brook and Nine Mile Creek) that serve as tributaries to Lake Erie. Doan Brook’s three branches form the Shaker Lakes, uniting in the wetlands at the Nature Center at Shaker Lakes, and flows west and northwest through Rudy Rodgers Memorial Park (formerly known as Ambler Park), Rockefeller Park, the Cleveland Cultural Gardens, and the Cleveland Lakefront Nature Preserve to Lake Erie. This is not the first year DBWP has conducted storm sewer stenciling activities, nor are they the only group that spreads their clean water message in with the stencils. Mills says this is, however, the first year they have targeted Dugway Brook. Volunteers will see a short stenciling demonstration before they are given supplies and street assignments to stencil. Mills says members of the group will have specific roles, from painting to tracking the number of signs painted to forming two-person teams who look out for oncoming traffic. Other volunteers will go door-to-door in the neighborhood, passing out literature on the project. Mills says large volunteer groups who would like to make the storm drain stenciling project an activity on a different day are welcome, too. The event runs from 9:30 a.m. to 12:30 p.m. on June 16 (or, in the event of rain, June 17). To sign up, visit the DBWP page, or contact Andrew Klooster, watershed programs assistant.